A project that has been bubbling along in the background over the last 12 months is the complete rig for a 56’ double ended ketch designed by Ed Burnett. 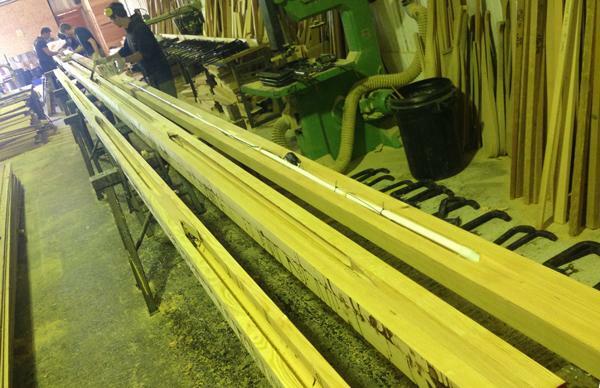 Currently under construction in Brazil, it was decided that the Columbian Pine spars were to be made here in the UK and shipped as a single package to the port of Vitoria after which the box will be transported up the coast by road to be united with the boat. All the spars are fully dressed with new stainless steel fittings supplied by Hercules in Dartmouth and on arrival will be ready for the standing and running rigging prior to stepping. Logistics of shipping a 70’ main mast, 52’ mizzen together with both booms and all the mast hardware has had to be carefully planned. To prevent any damage, the spars were carefully packed in a purpose built crate and secured in place using expanding foam. The lid then screwed down in such a way it could be easily removed; as no doubt the customs officials would be keen to have a look inside on arrival. With the high humidity and UV, choosing a suitable varnish system took careful consideration. In the end and after a number of tests the traditional Epifanes with extra UV was chosen as the top coat system. However prior to application the spars were coated with 7 coats of SP Systems Eposeal 300 to provide the varnish with a solid foundation for years to come. Currently en-route mid Atlantic, I’m sure there will be a sigh of relief once they reach there final destination. With such strict regulation on imported good it’s certainly been one of the more challenging exports we’ve done in recent years, but proves it possible to ship almost anywhere.